VPSN volunteers Celia Chung and Karen Quinn Fung give a presentation describing the connection between enjoyable walking experiences and public transit, at the Pecha Kucha Night Richmond event on November 29, 2013. A video with the slide show and audio from the presentation is now available online. Afghan art on TransLink Bus from Instant Coffee, 2008. Many thanks to the Richmond Public Art program for the invitation to participate in their PechaKucha night! The next volume of PechaKucha Night Richmond is happening on February 20, on the theme “What’s your story?” at Kwantlen Polytechnic University, Richmond campus. It’s an excellent event and opportunity to see and support the awesome work of those innovating throughout the region. 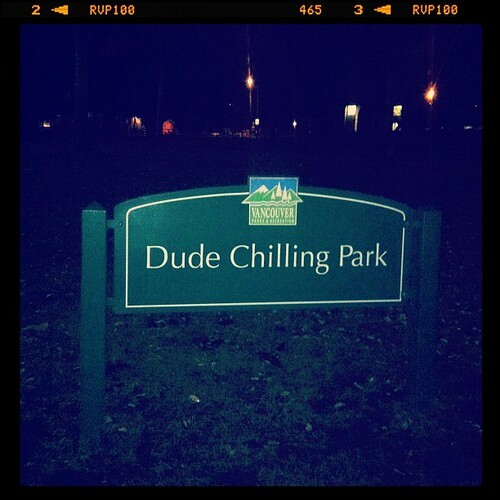 Remember the Dude Chilling sign that was installed, guerilla-style, in Guelph Park? Well it looks like it’s one step closer to becoming a permanent part of the greenspace. A just-released Park Board staff report is recommending this, and the issue will be discussed in detail at the next Board meeting on February 3, 2014. The sign, using a clever duplication of the traditional Park Board palette, is the handiwork of local artist Victor Briestensky. At the time of its installation in November 2012, news of the guerilla work went quickly viral, and supporters circulated a petition to keep the sign. Over 1,500 signatures were gathered. Which to our minds, is a great recommendation for a well-loved piece of guerrilla art. We hope Park Board Commissioners will agree. Exciting news! Two new community gardens are being proposed in Vancouver parks. Both are being discussed at next Monday’s Park Board meeting. Beaconsfield Park. Located in Vancouver’s east side, the proposed garden will be administered by the Italian Culture Centre. It will feature 40 garden plots covering approximately 800 square metres. In addition, the garden will include programmed spaces for gardening demonstrations, pollinator gardens and other landscaping. A portion of the food grown will support nearby community programs. Riverfront Park. Located in south Vancouver, this garden is being proposed by the Fraserlands Community Gardening Group. Like the Beaconsfield garden, it also proposes 40 plots over a smaller 630 square metres. 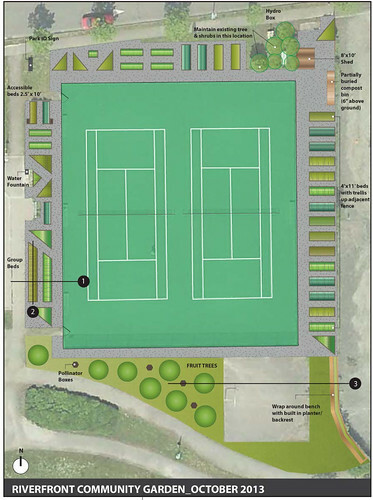 The garden, in fact, has been designed to wrap around the park’s tennis courts courts. 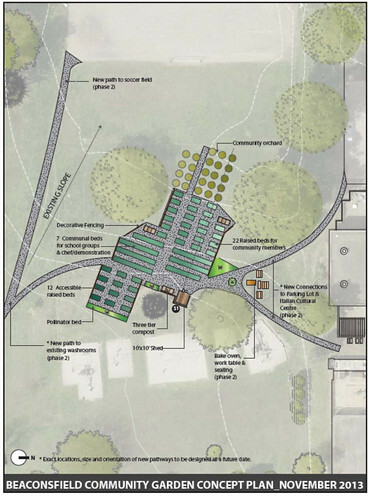 The accompanying Park Board report notes that the site was “carefully chosen … so as not to displace any existing uses.” The garden will also feature food bearing trees, pollinator gardens and bench seating, among other features. As noted above, both proposed gardens will be considered as part of the next Park Board meeting (Monday, January 20, 2014). If you’re interested in providing comment on one or both of these initiatives, you can write the Park Board directly at pbcomment@vancouver.ca. You can also sign up to speak at the meeting (or call 604-257-8158 to get on the speaker’s list). Curglaff. The shock felt in bathing when one first plunges into cold water. Happy New Year everyone! Looking to get things started with a splash of excitement? 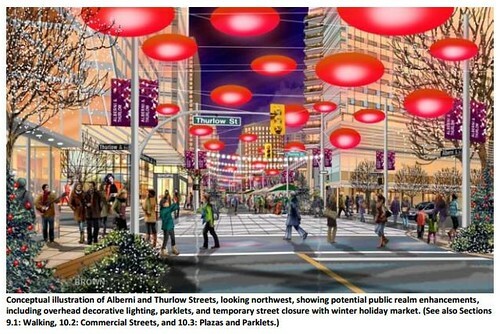 Why not start 2014 with one of Vancouver’s most bracing public space events. 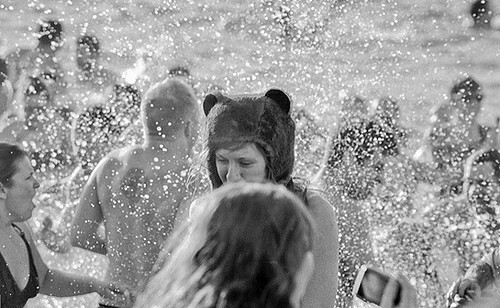 The 94th annual Polar Bear swim takes place at English Bay today, January 1st. Registration (if you want to get your name on the official docket) opens at 12:30, and the event itself takes place at 2:30. Last year more than two thousand folks signed up for a chilly, collegial dunk in the Pacific Ocean. For those that want more than just a quick plunge, there’s the Peter Pantages Memorial 100-Yard Swim Race – named for the fellow that started the Vancouver tradition in 1920. The first three first three swimmers to complete the race and reach the marker buoy will receive trophies. Know your limits in the cold water. Avoid diving into the water. Keep your dogs at home. For more information, you check out the Park Board website. 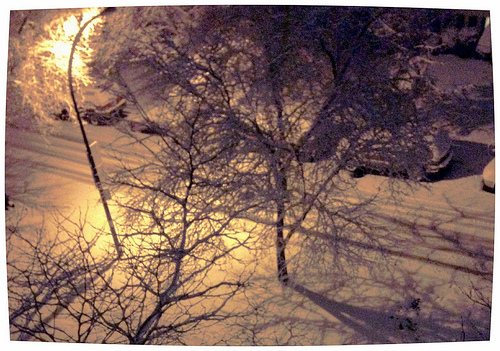 December 20, 2013 snowfall. Photo by Brent Granby. Happy snowy solstice Vancouver! 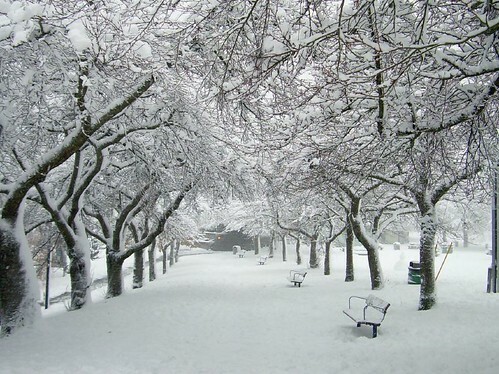 Don’t the city’s public spaces look extra cozy under that dusty white blanket? Aren’t you feeling all snuggly-wuggly? For those of you who may be looking at the snow and feeling yet another layer of a holiday-related pressure… stop right now. Grab a cup of cocoa. Sit down. We’re here to help. We first ran a version of our “Gift Ideas” post last year and it proved to be one of our most popular articles ever. We’ve shared it a few times since them, but we’re now reissuing it with a slew of additional updates for the 2013-14 winter season. Good news for the snow-adverse: some of these options don’t even require you to go outside! As we noted last time, our gift-giving rituals don’t all have to be about crass cable-knit sweaters (though for some reason those are actually popular this year). For the public space loving urbanists out there, there are a host of things that you can give to your friends and family that will not only make them happy, but do a nice turn for the city as well. Hang tight – there’s a whopping 18 last-minute holiday gift ideas in this post. All of them are awesome. Enjoy! (1) Support a local parklet project and contribute to the creation of neighbourhood public space. 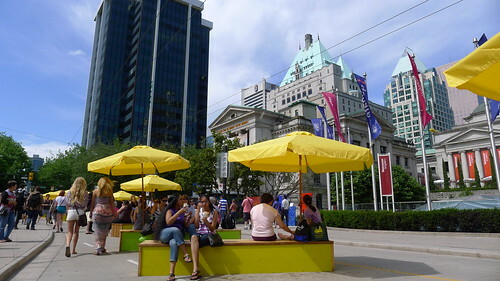 There are two AWESOME parklet projects currently under development in Vancouver. Design work on both sites are complete, and each project is now using crowd-funding as a means to finance the building and programming of the spaces. French Quarter Parklet – will transform two parking spaces (located in front of Chocolaterie de la Nouvelle France at Main Street and East 21st) into a vibrant outdoor seating area. The clever design and landscaping (featuring snappy triangle benches) also features a bike car for folks that want to stay on their bikes while having their coffee. The project is a collaboration between Choclaterie, and our good friends at PWL Partnership Landscape Architects and Cycle Chic. Donate to the French Quarter kickstarter campaign here. Commercial Drive Parklet – will convert two parking spaces (located in front of Prado Cafe at Commercial Drive and East 4th) into a permanent seating and gathering area for the whole community to enjoy. The Drive desperately needs more outdoor seating areas, and we’re pleased as punch that VPSN friend Julian Thomas and Board member Stewart Burgess are among the collaborators on this fine venture. Donate to the Commercial Drive Parklet Kickstarter here. (Note: this project lost some anticipated grant funding and are now looking to go beyond the initial $3,500 target. In addition to its great placemaking value, the Commercial Drive Parklet will be a vehicle to provide skills training for community youth). (2) A copy of one (or more) of the excellent books to come out this year by local urbanists. There were a lot of fine books on public space and urban issues to come out this year. We’re happy to recommend two that are near and dear to our heart. (We’ve had the pleasure of collaborating with both these authors in the past and love the work that they do!). Both are available at better bookstores around town. Happy City – written by local journalist and city-thinker Charles Montgomery – promises to “change the way you think about urban life,” doing so by exploring the multifaceted connection between urban design and the science of happiness. (3) Invest in your community with some Seedstock. Sure Bitcoin gets all the press, but while it may circumvent some of the problems of a global banking system, does it really do anything for local business? Did you know there’s actually an alternative currency that specifically supports local Vancouver business and non-profits? Seedstock Community Currency lets you do double with your money: exchange cash for Seedstock with a local cause to support their work, and get the equivalent amount of Seedstock back to spend at over 80 local businesses! (Find out where here). You can get ahold of money that feels good to spend – or give! – at the local xChange Station. (4) Go weekly or seasonally with some urbanist subscription action. Like reading about urban issues? Forefront is a weekly long-form essay that covers city-building activities from around the globe. It’s the product of Next City, a superb blog . You can obtain a subscription here. And of course, there’s also our good friends at Spacing, who produce a magazine (and several blogs) that “uncover the joys, obstacles and politics of Canada’s big cities by cutting through the cynicism that often pervades any discussion about urban issues.” Pretty good, eh? Their national issues come out twice a year and are a superb read. Order them here. (5) Give the gift of edumacation. Vancouver’s Community Centres and public schools offer a dizzying array of classes – everything from sports to singing, music lessons to language studies, fine arts to business, crafts to computers. Classes vary in length, location, and cost, but it won’t take more than a bit of research to see what’s available in your neighbourhood. Information on the city’s 24 community centres can be found here or you can zip over to the Vancouver School Board website to see what’s on offer there. Why not double-up the fun? Don’t just sign your loved one up for lessons… join them for the learning as well! (8) Support your local street performer. (Go retro, buy a CD!). There’s tons of local musical and artistic talent to be found around the city – on the streets and in transit stations. Like something you see or hear? Lots of street artists offer CDs, sketches and painting for sale – a perfect opportunity to support the local scene and share some of the magic with a friend. (9) Stay informed and stay up to date – While on the subject of street vending, keep your eyes peeled for two other items that make for great gifts. The Hope in Shadows calendar features top-notch work by DTES photographers and Megaphone Magazine. Revenue from both of these projects is used to provide education, training and support to low-income people in Vancouver’s Downtown Eastside. (10) Historical pictures. Who doesn’t like to see the way we used to live in years past? The Vancouver Public Library has a great selection of old photographs of Vancouver – which can be purchased for reasonable cost on Floor 7 of VPL Central. Or, you can go the DIY route and visit the Vancouver Archives on-line catalogue – where they have an amazing assortment of high-resolution photographs that you can download for free. Having the VPL and Archives print your pictures for you may mean a bit of a delay — but not to worry, many of their collections are available on-line and in high-resolution. You can print ’em yourself via your local photo shop. (A word to the wise – the VPL and Archives collections are different. So if you’re looking for that perfect photograph of, say, Robson Square during the 1960s paint-in, you may have to visit both facilities). (11) Friends-of Gift Memberships. Both of the aforementioned organizations (the Vancouver Public Library and Vancouver Archives) have volunteer “Friends-of” groups that support their work. The Friends of the VPL and Friends of the Archives both engage in special projects, raise funds for new acquisitions, and champion the work of their respective organizations. Know someone who likes libraries or gets jazzed about archival fonds? Set them up as a patron of one of these groups by buying a gift membership. (12) Go green with local nature. For over two decades the Stanley Park Ecology Society has played a leadership role in the stewardship of Stanley Park. They do this through a range of education, research and conservation programs. You can support the good work they do by taking out a membership with their organization, “adopting” a bird’s nest, paying to plant saplings or several other things. (13) More brightening, less frightening – Bike & Ped lights. There are too many people out there still walking and biking around without decent lights or reflective gear (Velcro bracelets, vests, etc.). Why not keep your loved ones safe by upping their visibility. MEC is an obvious go-to (and their new USB plug-in lights are awesome!) but there are lots of other places to get this sort of gear. Know someone who’s not a cyclist but ought to be? If they have a bike that’s kicking around and gathering dust – why not surprise them with a tune-up (at Our Community Bikes, Kickstand or your neighbourhood bike shop). Another idea, especially for newer bike users: give the gift of cycling confidence and sign them up for a streetwise biking course with HUB. (14) Make a gift box on behalf of a friend or family member. The holiday season is festive and fun for many of us. For those less fortunate, the seasonal festivities can also be a time of loneliness and challenge – a time that is further compromised by the city’s cold, wet and rainy weather. There are lots of organizations around town – Lookout, the Aboriginal Front Door, Covenant House, the Downtown Eastside Women’s Centre, Carnegie, the Union Gospel Mission, the Kettle Friendship Society (to name just a few) – who will take donations of money, food, warm clothing (socks, sweaters, long johns, rainwear), toiletries, and other un-wrapped gifts. (15) Make your own walking tour. Why wait until May for Jane’s Walk? Plot out a stroll and show your friends and family some of your favourite spots – the architecture you like, your favourite pieces of public art, a hidden park, other good places to meander. Show them why you like the city. Want to amp it up a bit? Put a few more treats into the itinerary – like a stop at your favourite café or restaurant for hot chocolate, or an end-of-walk admission ticket to the VAG or Science World. (16) Surprise them with some random market magic. Still searching for some stocking-stuffers? You’ve just scored yourself a great opportunity to support Vancouver’s market scene. The annual Christmas Market occupies Queen Elizabeth Theatre Plaza between now and December 24. For the foodie on your list, there’s the weekly Winter Farmers Market at Nat Bailey Stadium – every Saturday from 10am-2pm). And if you want to go all-in, wander over to Granville Island for any number of specialty gifts. (17) A membership with Modo – A casual membership to Modo (formerly the Car Co-op) costs $50 and gives you access to a range of vehicles for those times when you actually do need a car (which, for lots of folks, isn’t as as often as they think). It turns out that the self-same membership also gives you a bunch of other perks as well. (18) A membership in another co-operative! You’ve probably heard about co-op housing before, but there are also a good number of co-ops that sell goods and services around town. These include the aforementioned Modo and ever-popular MEC, as well as smaller ones like the Vancouver Tool Library or East End Food Co-op. Co-ops are a good place to shop for those who want to support locally owned, member-driven organizations that operate with a concern for community. Buying a membership in a co-op is a great investment and a smart gift – and will turn your holiday gift exchange into a gala event! 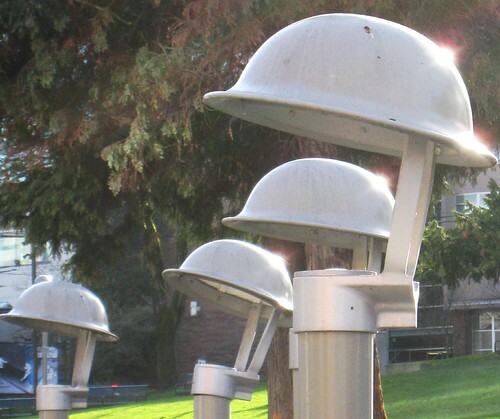 If you’ve got other public space gift ideas, please send them our way – via info [at] vancouverpublicspace [dot] ca. Thanks to Mike, Kevin, Paola, Julian and Kathleen for their contributions to this post. Okay, it’s not quite as wintery as the photo implies… but it’s still frosty out there. All the more reason to mark your calendars for the annual VPSN Winter Party! Please join us on Thursday December 12, 2013 at 7pm for a dose of festive cheer. We’ll be hunkering down at the ever lively Dunlevy Snackbar for the occasion (433 Dunlevy Avenue at East Hastings). Gather all your urbanist friends and colleagues and come on out for some fun! Food, fun and mystery. Yummy appies will be served and a cash bar will be on hand. Mix and mingle with fellow public space enthusiasts, check out our ‘year in review’ slide show, and watch as we unveil something brand new and very exciting. 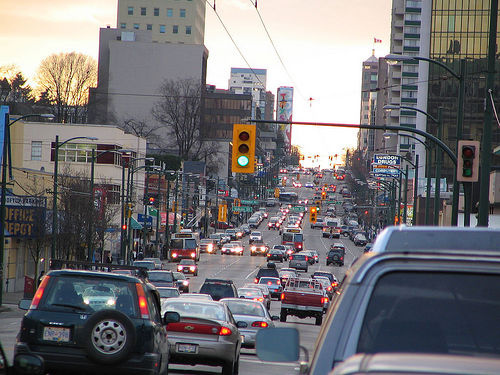 Transportation continues to be a very hot topic in Vancouver right now. Here is a quick round-up of our activities on transportation, as well as many other great, relevant reads and events. Tuesday, November 26 – VPSN’s public transit projects lead Karen Quinn Fung will be leading a discussion on the transit referendum. This limited-seating event is part of a speaker series from local web and mobile application firm Denim and Steel, who are hosting the event at their offices in Mount Pleasant. Tickets: $12 and come with food and drink; please see Denim and Steel’s website to purchase tickets online. Friday, November 29 – VPSN Volunteer Celia Chung and VPSN public transit projects lead Karen Quinn Fung will also be speaking at Pecha Kucha Night Richmond, Volume 4. It will be a fantastic night of speakers all bringing unique perspectives on the theme of “Planes, Trains and Automobiles.” The event is free (no tickets required), has a capacity of 120 people, and will be held at the Richmond Cultural Centre, a short walk from Richmond Brighouse Station — a great excuse to take the Canada Line to its terminus and check out Richmond’s No 3 Road and City Hall nearby if you haven’t had a chance to yet. More info: Pecha Kucha Night Richmond site. Looking ahead – we are anticipating the results of the City of Vancouver and TransLink’s Downtown Local Bus Service Review in January 2014 (especially as it pertains to our work on the potential pedestrianization of Robson Square), as well as the outcomes of TransLink’s Regional Transportation Strategy process. Thursday, November 21 – SFU’s City Program presents a lecture with two Australian Planners (Greg Vann and Warren Rowe) drawing comparisons between Vancouver and Brisbane, Australia. Both come from the Brisbane region in Queensland — an area roughly the population, age and growth rate of Metro Vancouver. More information from the City Program, or register here. Monday, November 25 – Get On Board BC is having a casual meet-up at Metrotown. Get On Board BC is the coalition in support of sustainable funding for transit. If you are interested in volunteering or learning more about, this is a great chance to meet the wide spectrum of folks working across the region to improve transit. RSVP and more information is on Facebook. Thursday, November 28 – are you or do you know a musician who enjoys performing in public space? TransLink is holding auditions for its busker program – applications are due on November 28th, while the auditions themselves are held on December 4th. See TransLink’s website for more details about the program and check out the Buzzer blog for a bit more about the process. An event was held on October 31st called Moving the Future – A Conversation About Transportation and the Economy at the Vancouver Convention Centre, featuring a number of speakers discussing the relationship between the transportation system (including transit) and its relationship with Vancouver’s economy. Videos from all of the day’s sessions are available at the Moving the Future event website. Highlights for public space and transit? Gil Peñalosa bringing his trademark enthusiasm to tackling why safe cycling and walking in cities matters, and an interesting series of responses to a question put forth by Peter Ladner about the relationship between the future of transportation in Vancouver and its relationship to, on the one hand, the burgeoning green economy and, on the other, projections for continued economic activity based in resource extraction. Paul Lee, Rapid Transit & Strategic Projects Manager, City of Surrey. An audio broadcast of the entire event (running 1h14m) is available online from UBC Alumnni Dialogues’ site. Local transit commentator Stephen Rees also has a summary of the talk at his blog. Eric Doherty released a report on HandyDART, TransLink’s bus service for seniors and people living with disabilities, and the impacts of its severely underfunded state on quality of life and mobility for those who are dependent on it. Download the report (PDF), or read more about what it says and what it all means via Vancouver Media Co-op. Next week, City Council will be deliberating over the first in the latest generation of community plans. This one covers the West End. We’d encourage any public space enthusiasts to take a look at the document. City Council is looking for feedback, and you can share your comments, ideas, suggestions and the like. The draft Plan can be found here. There’s lots to be found within it’s 126 pages. Community plans are comprehensive policy documents that set out long-term (20-30 year) policy covering housing, local economy, heritage, social facilities and more. The new plan also includes a Public Benefits Strategy, which details how civic investments – in community centres, childcare, etc. – will be prioritized over the next few decades. There’s also material relevant to public realm issues to be found in a number of other chapters. If you live, visit or work in the West End, you’ll want to have a look at this document. If you’re interested in the way neighbourhood-scale planning is evolving in the city, you’ll also want to have a look. Once you’ve done so, consider sending your feedback to City Council. You can write to them via email at mayorandcouncil@vancouver.ca. You can also present your thoughts in person, during the Council Meeting. The session takes place Wednesday, November 30, 2013 at 9:30 am. The agenda for the meeting can be found here. To find out more about how you present to Council, check out this City webpage. The City of Vancouver will host the following ceremonies to recognize the contribution our Veterans have made and to honour those who made the ultimate sacrifice on behalf of Canada. As the cauldron comes to life, a senior veteran will handover Canada’s flag to a member of the next generation of veterans, acknowledging the continuing service and loyalty of Canadians from generation to generation. Regimental units taking part in this year’s ceremony include 50 members of the 39 Canadian Brigade and HMCS Discovery. RCMP officers will stand as sentries while the all-Cadet Vancouver Flag Party marches in. Flt. Sergeant Tony Zhao of the Pegasus Air Cadet Sqn. 111 will sound the Last Post and Reveille. Pipe Major Alistair Pattison of the BC Regiment Pipes and Drums will pipe the Lament. The cauldron will be extinguished at 11 am, coinciding with Two Minutes of Silence at Victory Square. The program begins with a performance by the Vancouver Bach Youth Choir and Sarabande starting at 10 am. Led by the Vancouver Flag Party, the parade of veterans, military marching units and bands will arrive at Victory Square before the ceremony begins at 10:30 am. At 11 am the Last Post will be sounded. There will be Two Minutes of Silence, during which a 21-gun salute by the 15th Field Artillery Regiment will be heard from Portside Park. Rouse and Lament will follow. The RCAF will conduct a fly-past moments later, weather permitting. The enduring In Flanders Fields will then be sung by the Bach Youth Choir and Sarabande and wreaths will be placed at the Cenotaph. The combined bands of the Vancouver Fire and Rescue Service and the Regimental Pipes and Drums of the Seaforth Highlanders of Canada will perform, after which the parade march-off begins. The parade proceeds west along Hastings Street, turning right at Richards Street, east on Cordova, then south on Cambie and marching past the reviewing stand at Victory Square. Aboriginal Veterans will hold a ceremony at the Victory Square Cenotaph on November 8, National Aboriginal Veterans Day. A march will get underway at the Carnegie Centre at 10:15 am and proceed to Victory Square. The official ceremony begins at 10:45 am. The Remembrance Day Service at Victory Square event is organized by the Vancouver Remembrance Day Committee, a volunteer group established by the City in the 1940s with the mandate to conduct the November 11 ceremony on behalf of its citizens. The VPSN is excited to be part of an upcoming City Conversations event at SFU Harbour Centre next week. We’ve participated in these before, and they’re always result in a great discussion and sharing of ideas. Brian Mills, TransLink’s Director of Service and Infrastructure Planning. The event takes place on Thursday, November 7 at 12:30pm; at SFU Vancouver, Harbour Centre – 515 West Hastings, Room 1600. We’re moving over to the new VPSN website!